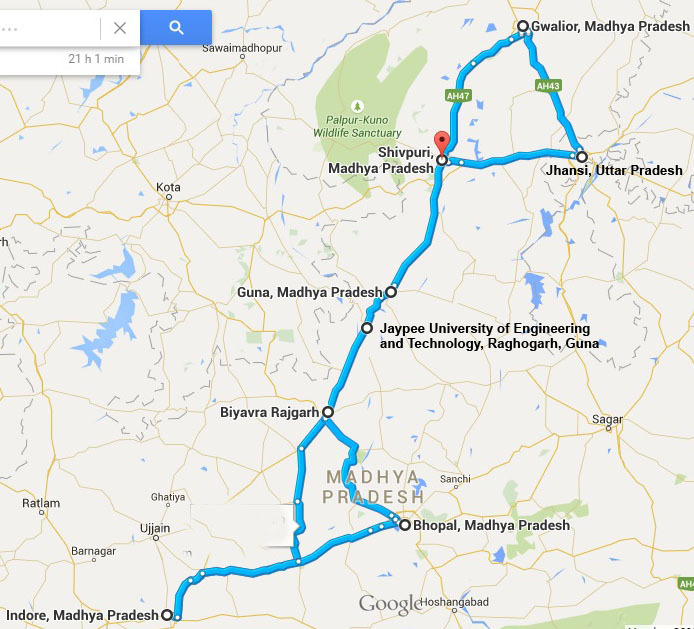 Jaypee University of Engineering and Technology being located on NH-3 is well connected by Road to Gwalior, Bhopal and Indore. The road is in good condition, regular bus services of State Transport Corporation’s and private Buses are plying on the road frequently. All the buses stop at JUET Gate on request. This distance can be covered in 4 – 5 hours. It is also connected with the Western Railway 's broad gauge line of the Kota Bina Section. Another rail link, viz., Guna-Maksi connects it to Indore and Ujjain. The total rail length in the district is about 141 Km and the route kilometer per 100 square KM is 1.27. Recently Guna-Gwalior section is opened for the railway traffic. The trains are available for Kota, Bina, Ujjain, Indore and Gwalior. The details about the train timings and their frequency at Guna is given in RAILWAY TIME TABLE. The nearest national airport is Bhopal and international airport is Delhi. Guna, the gateway of Malwa & Chambal is located on the northern - eastern part of Malwa Plateau between Parbati and the Betwa rivres. Mathematically the District is situated between the radiameters 23'53" N and 25'6'55 N and langumate 76.48' 30"E and 78', 16'70"E. The Parbati is the main river flowing along the western boundary touching Rajgarh District of M.P. and Jhalawarh and Kota District of Rajasthan. Shivpuri & Kota are located in north where as Vidisha, Bhopal, and Rajgarh lies to the South. The total area of District is 6484.63 sq. km. with a population of about 8.5 lacs. Guna District is divided into five tehsils, Raghogarh is one of the Tehsil where the institute is located. It is well connected with the Road and situated on the National Highway No. 3 Agra-Bombay National Highway (A-B Road) From Raghogarh, Gwalior is 250 km to the north of it, Bhopal 190 km to the south and Indore 250 km's to the south. The important places of this District are Palai, Guna, Ruthiyai, Aron & Binaganj. The state Highways is all weather roads in the district, which connect important towns.